Well folks it has been a long time coming but finally, here it is! I cut out this Black Corduroy for a Pinafore Dress way back, probably sometime in 2017 and since then it has been languishing in the ’roundtoit’ pile. One of my resewlutions(sic) for this year is to clear the back log of UFO projects that are cluttering up the sewing room and preventing me from thinking clearly and positively about future plans. I have stitched up stuffed toys, hand sewn binding onto quilts and finally got around to this project. 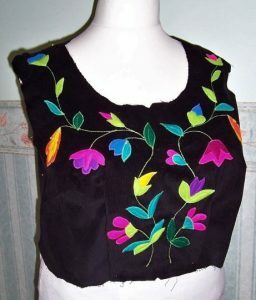 A plain Black pinafore dress. This seemed a might boring – let’s add some colour! 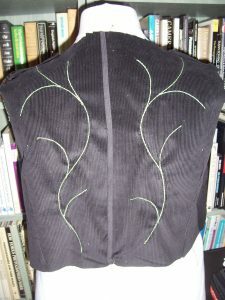 Having stitched the darts and checked the fit, I thread traced some ‘vine lines’ onto the bodice back and front. 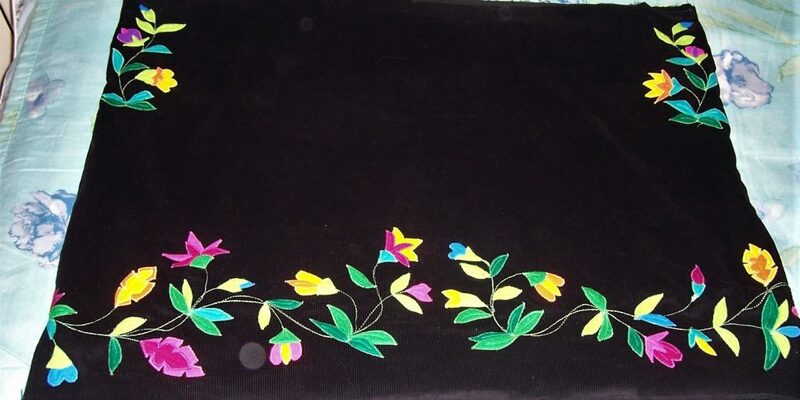 Referring to several inspirational pictures of wool felt embroidery I then set about cutting pieces for flowers and leaves to decorate the vine lines. 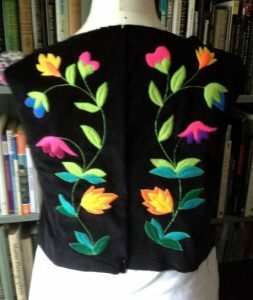 The motifs were pinned in place and reorganised a little before stitching in place with a narrow zig-zag stitch. 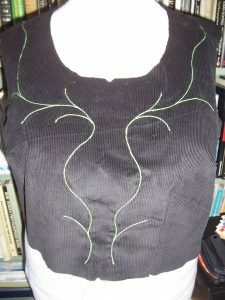 Once completed I then made up a lining and stitched into place around the armholes and neckline. I had left the centre back and side seams open to facilitate turning through. Machine basted these seams and again checked fit. All fine so the bodice was completed. Now onto the skirt. 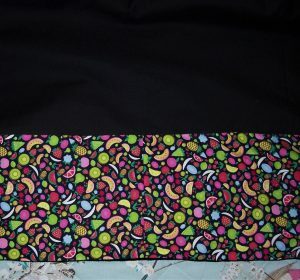 I had cut out pocket bags to my usual pattern and added them to the side seams of the two skirt panels. My favourite pocket bag pattern is drafted to the waistline seam where it is stitched and avoids the pocket bags from flapping about too much. As I wanted a ‘stepping stone’ of embroidery, I stitched two ‘vines’ on the front skirt panel, aligning with the pocket openings. 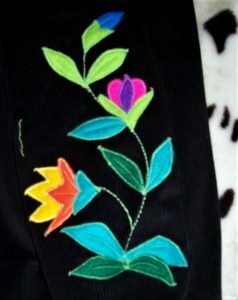 And finally, the hem applique. This seemed to take forever and involved a lot of pinning, checking and re-applying motifs until I was happy with the arrangement. 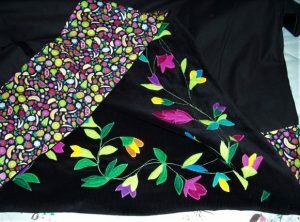 As the skirt is not lined on the reverse you could see all the bobbin threads of the zig-zag stitching. I found a length of pretty colourful cotton print and cut a wide band which I then applied to the reverse of the skirt hem. The top edge of the band has been turned under by ¼ inch and hand stitched in place. The hem band fulfils two functions. 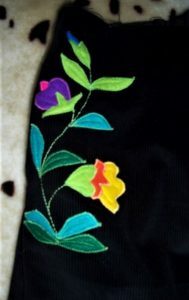 It covers up the reverse of all the applique/embroidery stitches and adds some weight to the skirt hem. I am very pleased with the final effect. Attaching the skirt to the bodice was the next step in construction. To begin with I thought that due to the thickness of the fabric, I would make box pleats. It turned out that there was insufficient width in the skirt panels to make them look effective. I originally lined up the side seams of the bodice with those in the skirt but this left too much fullness in the back and not enough in the front. To overcome the problem, I moved the side seams of the skirt forwards by 2 inches which also makes access to the pockets more easy. In the end I placed some small inverted pleats on the front skirt aligned with the centre front and body darts with the remainder of the fullness gathered gently to fit the bodice waistline. Finishing the insides of the bodice lining would be a simple matter of turning up half an inch to the inside and slip stitching the folded edge to the skirt/bodice waistline seam. I was about to do that when I discovered the skirt lining panel in the pile of fabrics to the side of the sewing machine. This is what happens when you leave garments cut out for over a year before you start to stitch them up! Ahh, a few more sewing operations before I can finally finish this garment! As the skirt lining panel was cut from one width of very wide acetate lining, I needed only one French seam in the centre back. I marked the quarters and then ran a gathering thread around the top. This was pulled up to fit the waistline seam of the pinafore and pinned into place. I checked the length of the lining and to ensure that it was no longer than the corduroy, turned up a wide hem of 2 inches folded under a further 3 inches. The hem was machined in place and the gathered top was overlocked to the waistline seam. It took just 40 minutes to bring down the bodice lining, turn up 1/2 inch and then slip stitch to the waistline seam. All done! The pinafore dress is pullover style and looks good over my fine polo neck sweaters. When the weather is a little warmer I shall also be able to wear over plain blouses or tee shirt tops.